Introducing AWS Global Accelerator, a network service that enables organizations to seamlessly route traffic to multiple regions and improve availability and performance for their end users. AWS Global Accelerator uses AWS’s global network to direct internet traffic from end users to applications running in AWS regions. AWS says its global network is highly-available and largely congestion-free compared with the public Internet. Clients route to the optimal region based on client location, health-checks, and configured weights. No changes are needed at the client-side. AWS Global Accelerator supports both TCP and UDP protocols. It provides health checking of target endpoints and then will route traffic away from unhealthy applications or congested regions. Pricing is based on gigabytes of data transferred over the AWS network. A new AWS Transit Gateway will let enterprises build a hub-and-spoke network topology on AWS infrastructure, enabling the interconnection of existing VPCs, data centers, remote offices, and remote gateways. The customer gets full control over network routing and security. Connected resources and span multiple AWS accounts, including VPCs, Active Directories, and shared services. The new AWS Transit Gateway may also be used to consolidate existing edge connectivity and route it through a single ingress/egress point. Pricing is based on a per-hour rate along with a per-GB data processing fee. AWS is launching its first cloud instances based on its own Arm-based AWS Graviton Processors. The new processors are the result of the acquisition of Annapurna Labs in 2015. AWS said its Graviton processors are optimized for performance and cost, making them a fit for scale-out workloads where you can share the load across a group of smaller instances. This includes containerized microservices, web servers, development environments, and caching fleets. The new A1 instances are available now in the US East (N. Virginia), US East (Ohio), US West (Oregon), and Europe (Ireland) Regions in On-Demand, Reserved Instance, Spot, Dedicated Instance, and Dedicated Host form. In addition to processors from strategic partner Intel and its own AWS Graviton processors, AWS is offering cloud instances powered by AMD at a 10% discount. AWS introduced Firecracker, a new virtualization technology for #containers -- think microVMs with fast startup times (125ms). The company says Firecracker uses multiple levels of isolation and protection and exposes a minimal attack surface for better security. Firecracker is expected to improve the efficiency of AWS infrastructure. It is also being released as open source. Firecracker is already powering multiple high-volume AWS services including AWS Lambda and AWS Fargate. Epic Games, creator of Fortnite, is running on AWS. Amazon Web Services introduced RoboMaker, a new service for delivering intelligent robotics functions using cloud services. AWS RoboMaker extends Robot Operating System (ROS), which is the most widely used open source robotics software framework, by adding connectivity to AWS services including machine learning, monitoring, and analytics services. AWS RoboMaker provides an AWS Cloud9-based robotics integrated development environment for application development, robotics simulation to accelerate application testing, and fleet management for remote application deployment, update, and management. The idea is to enable a robot to stream data, navigate, communicate, comprehend, and learn. Initially, AWS RoboMaker is available in US East (N. Virginia), US West (Oregon), EU (Ireland), and will expand to additional regions in the coming year. Amazon Web Services announced two more high profile companies going :all in" or designating it as their preferred public cloud provider. Ellie Mae is going "all in" by moving its infrastructure to AWS while rebuilding its core applications and creatomg new digital products for the evolving needs of homebuyers. Ellie Mae will use the breadth and depth of AWS services, including compute, storage, database, serverless, and containers, to develop new ways of delivering the digital mortgage and simplifying the loan process for its customers and partners. Ellie Mae has already built a company-wide data lake on AWS using Amazon Simple Storage Service (Amazon S3) to better understand, personalize, and further automate digital lending. Mobileye, an Intel company, chose AWS as its preferred public cloud provider for its autonomous vehicle business. Mobileye is running core workloads on AWS for greater speed, agility, and compute power. Mobileye is using AWS’s broad portfolio, including compute, storage, database, analytics, machine learning, and edge computing, to supply automakers with the most advanced self-driving applications. As Mobileye grows workloads on AWS, the organization will build a data lake on Amazon Simple Storage Service (Amazon S3) to ingest, process, and analyze hundreds of petabytes of vehicle data gathered from sensors, images, and video feeds. Dynatrace announced the extension of its platform’s cloud visibility and contextual data ingestion from Amazon Web Services (AWS) with Amazon CloudWatch (CloudWatch) and AWS CloudTrail (CloudTrail). The company says the addition of AWS metrics and events from the two services enriches the high-fidelity data that it processes. This enhances its contextual problem identification and root cause analysis. AWS CloudTrail allows businesses to monitor and log account activity related to actions across their AWS infrastructure. CloudTrail log ingestion extends Dynatrace AI’s automated root cause analysis and problem detection to include AWS account-initiated activity. This data provides ops teams with insights into not just what caused a problem, but also which user or account made service-impacting changes. Cylance announced support for Amazon Web Services (AWS) with its CylancePROTECT for the cloud. Cylance simplifies cloud security by utilizing an agent with a small footprint and with no configuration or signature-update needs. Openreach announced the planned extension of its Gfast network in a further 81 locations across the UK, including London, Leicester, Manchester, Worth, Birmingham, and Blackpool. The multimillion pound investment will extend the service to just over a million homes and businesses. This latest announcement complements a wider investment programme in FTTP networks, which is on track to reach three million homes and businesses by the end of 2020. By the mid-2020s, Openreach aims to reach a total of 5.7 million properties using Gfast, and also wants to extend its FTTP rollout to 10 million premises. Openreach said its new Gfast network builds on existing infrastructure and changes the way broadband signals are transmitted from existing street cabinets to boost speeds up to 330 Mbps (seven times today’s UK average), without the need to dig up roads and install new cabling. StarHub completed the first outdoor pilot of 5G New Radio on 3.5GHz frequency band in Singapore. 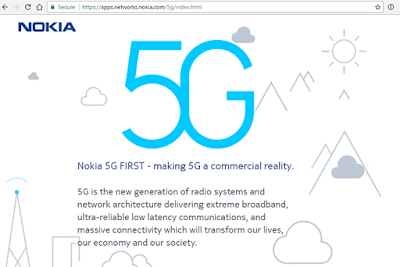 Nokia 5G radio technology was demonstrated interworking with StarHub's 4G core network. 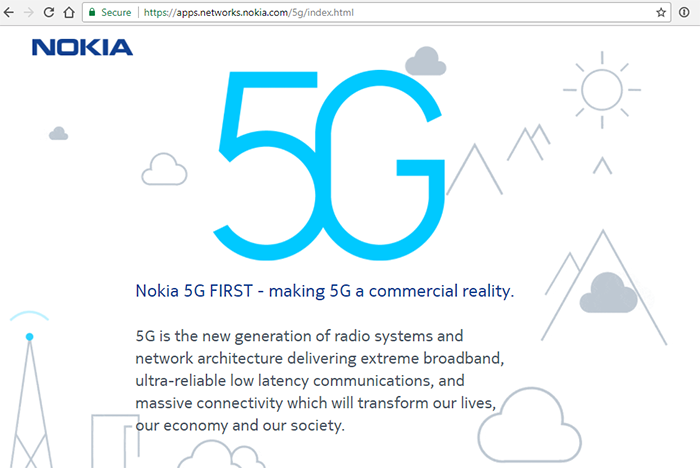 Nokia deployed AirScale Radio Access technology with 5G New Radio 3GPP-compliant software and the Nokia AirFrame data center solution, leveraging its services expertise to optimise deployment. 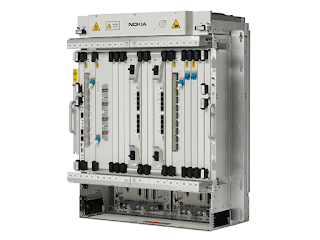 Telecom Egypt has doubled the line capacity of its its Delta Region DWDM backbone network to 200G using Nokia's Photonic Service Engine (PSE) technology and its existing Nokia PSS 1830 switches. Commercial deployment of the new high-speed service started in June and represents the first 200G long distance, single carrier transmission service in Africa. 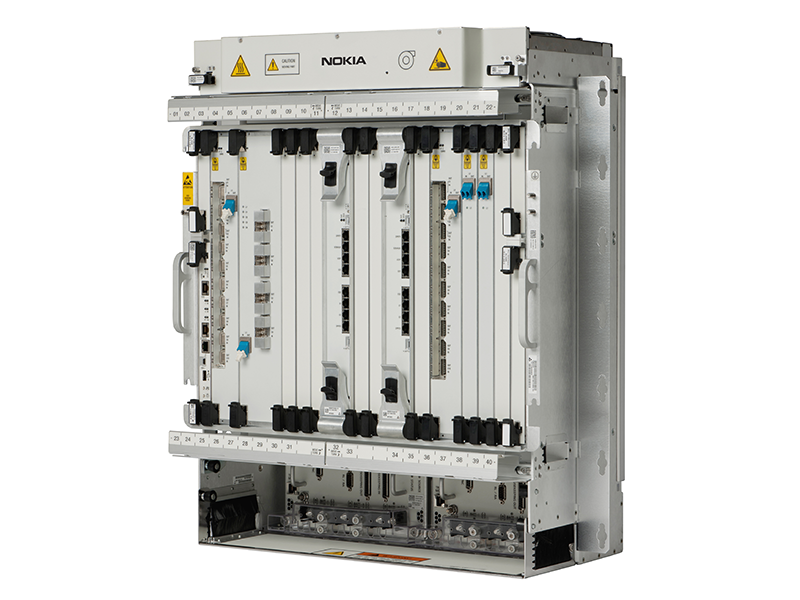 Specifically, Telecom Egypt is upgrading its backbone network using the Nokia 500G DWDM Muxponder, a programmable card that provides wavelength capacities from 50G to 250G per line port.